It is not so easy a task to do a traveling like mine in the USA. I don’t drive. I don’t fly. I just visit places by either by train or by bus. That’s fine as long as there is a public transportation available. I would not mind walking some distance to a station or bus stop if I had to. At least it burns my surplus fat I seem to be gaining in this journey. In one recent trip to Oxford, Mississippi I had some difficulty as there was virtually no ordinary public transportation available into Oxford from nearby cities. However what makes me really sad is not only that. But it is the fact that in this country the sidewalks often disappear suddenly in front of your eyes. Oh, how many times I had to look for walk-able pass nearby and negotiate crossing busy streets to the opposite side for more walk-able pass. It is not only dangerous but also depressing, especially if you find your only shoes sopped in muddy grass after a rain of the previous night. On such occasion it hits you that this country’s roads have been constructed for the sake of cars first of all, not for pedestrians. Well if you always stay at a hotel in downtown area, perhaps there is no problem walking around the places, no doubt. But for someone like me, making this half a year journey on my own, those hotels and inns in downtown areas are way beyond my budget. It was especially so in the North East coast areas. Therefore naturally I try to find a reasonable accommodation in the outskirts. After arriving at Oxford, the thing went better than I had expected. I checked into a hotel called Comfort Inn along the Jackson Avenue. There was a substantial side walk all the way to downtown through the campus of the university, affectionately called Ole Miss. It took me about 40 minutes to reach the downtown center called the Courthouse Square. The weather was perfect. Almost everyday I enjoyed the long walk after having a free substantial breakfast including the “sausage gravy” at the hotel. And the Oxford downtown was also something worthwhile visiting. It was “breathing.” I saw local people walking, dining and shopping there. In other cities the downtowns were deserted, I had that kind of impression, by the local residents. They go shopping to the big malls in the outskirts. The traditional stores, mostly mom and pop ones, which have been the core and magnets of the community, have been left to decay. Unfortunately it seems to me that the process of robbing of the vigor from the downtown is occurring throughout the country. I don’t know if there is a term of this kind of trend, sort of “degeneration” for the downtowns. If you only quest for the convenience of city life, then you lose something you’ve been brought up with when you were once kids. In Oxford, I’ve felt that a bookshop has played a crucial role in bringing in that vitality. 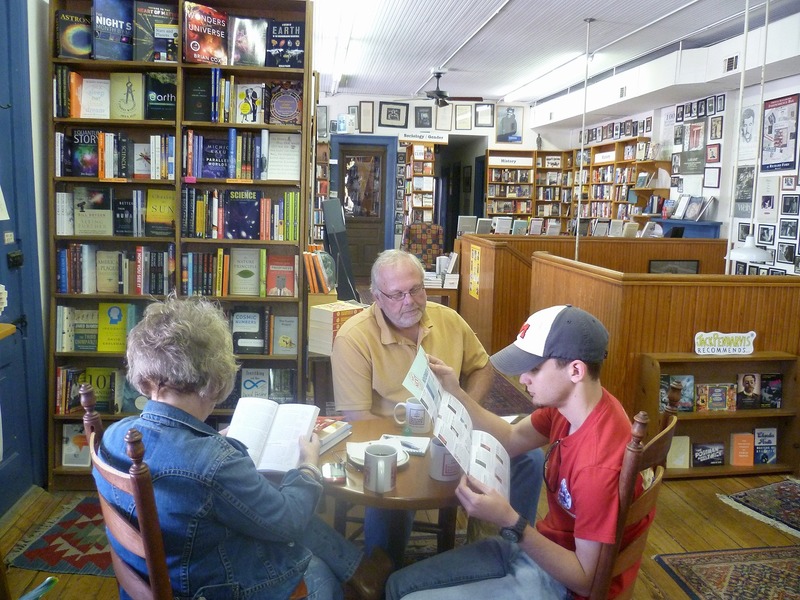 It is the store called “Square Books” run by Richard Howorth. Actually He had three bookstores facing the Courthouse Square. 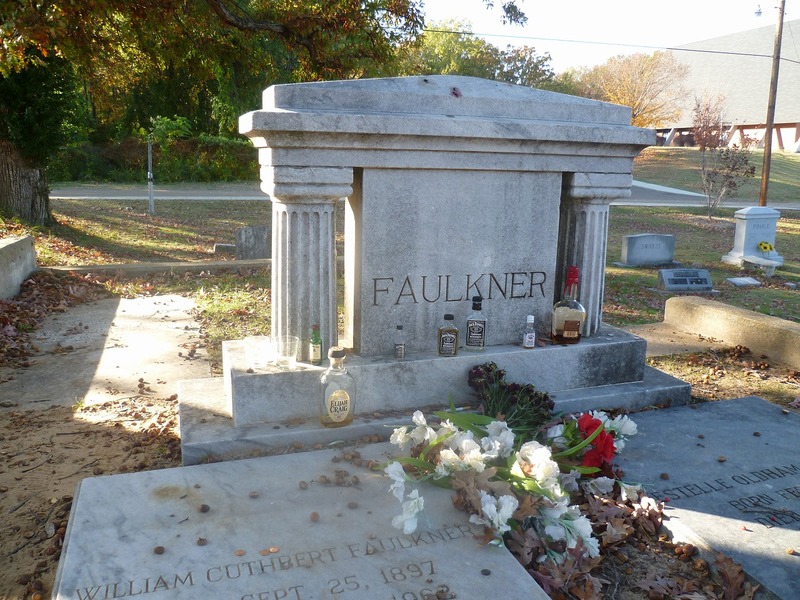 He said that Oxford was lucky as they have Ole Miss campus right in the middle of the city and as it happen to be birthplace of a great American writer, William Faulkner (1897-1962). 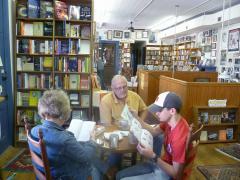 But people told me that since he opened the bookshop there in 1979, his shop was a driving force to revitalize Oxford. In one of the three bookstores for spring and summer there is regularly an evening of music and reading event every Thursdays. At one recent Thursday I attended, all the 150 chairs were occupied. It was a stimulating evening, listening to the live music and also the readings by the authors local and out of state. 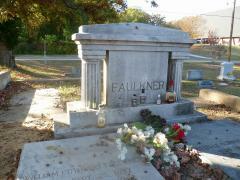 Well my object to visit Oxford was to have a glimpse at Faulkner’s life. The modest but refined two-storied house where he had lived till his death was well preserved and stood among rowan oak trees. Producing those fabulous stories of “Light in August,” “Sanctuary” and “Absalom Absalom!,” with the racial tension and self-afflicting violence, while living a tranquil life in the woods. Once ridiculed as “Count Nocount” by local residents, but eventually respected especially after receiving the Nobel Prize in 1949. On the last day of my stay I’ve walked to his grave. I followed the custom as I was told to do so in visiting the writer’s grave. As he was a writer, who had once said that “civilization begins with distillation,” I carried with me a small bottle of whisky I had bought the previous day. I unscrewed it in front of the grave to show that it is brand-new. It was too good, I thought, to leave it unappreciated on the tombstone and maybe he wanted a companion for the drinks. So I lingered for some time and enjoyed a few sips myself from the bottle and left the rest to the great writer. I hope he didn’t mind my impudence. Newer: Seasonal word in Key West?